A visual delight to behold in your bar area, the Vista Bar Stool Blue Velvet will add modern class to the kitchen and beyond. The Vista is a comfortable design with contemporary style that is destined for success in a wide variety of locations. 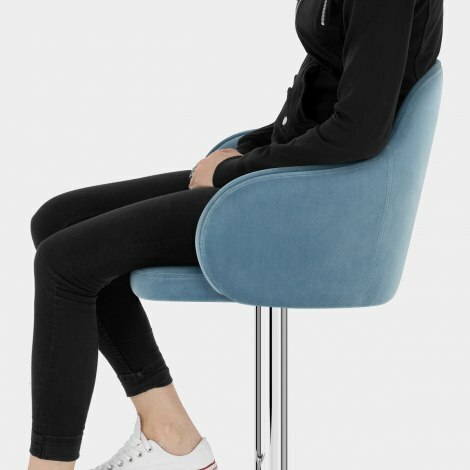 Cushioned for optimum comfort, the blue velvet seat has a high backrest with accompanying armrests that deliver chair-like support at bar height. A single stitch line adds detail to the backrest as a subtle finishing touch. A sturdy polished chrome gas lift frame supports the seat. 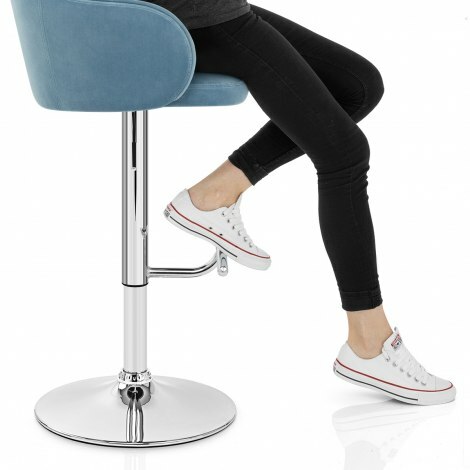 This lends shining style and also allows for easy adjustable height and 360-degree swivel. Meanwhile, a T-bar footrest offers style and comfort whilst the circular base features a protective floor guard on the underside. "This chair is gorgeous and as expected"
This chair is gorgeous and as expected. Delivery great and easy to assemble. Great quality fabric.